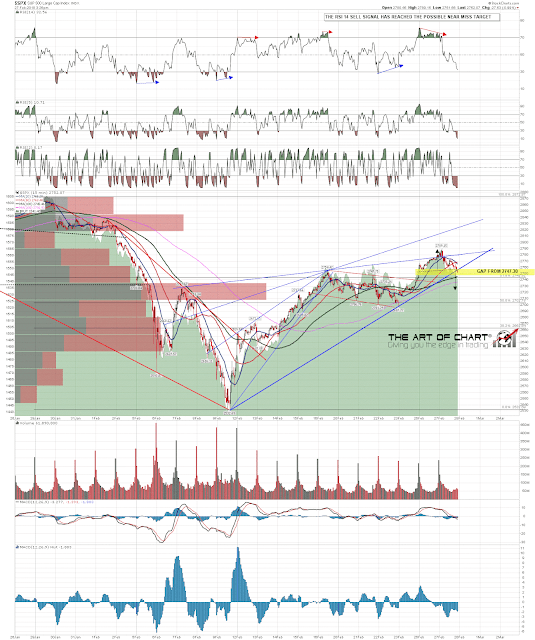 The specific setup on SPX here is that this is firstly a test of a series of support levels close together. The first double support level is yesterday's low at 2753.78 and rising support from the lows and both are now broken. The other support level is the open, possible breakaway, gap from Friday's close at 2747.30. If that gap fills then the path is open to go and backtest weekly pivot at 2731, and maybe the daily middle band now at 2717. There is a decent looking H&S that on a break down would have a target in the 2724 area. What happens if we see an all time high retest? Well that might well be the second high of a double top, but that will be easier to call on the structure when we see the retest. I remember seeing the very talented satirist Tom Lehrer on his last world tour in the 1980s, 'The Poisoning Pigeons In The Park' tour. 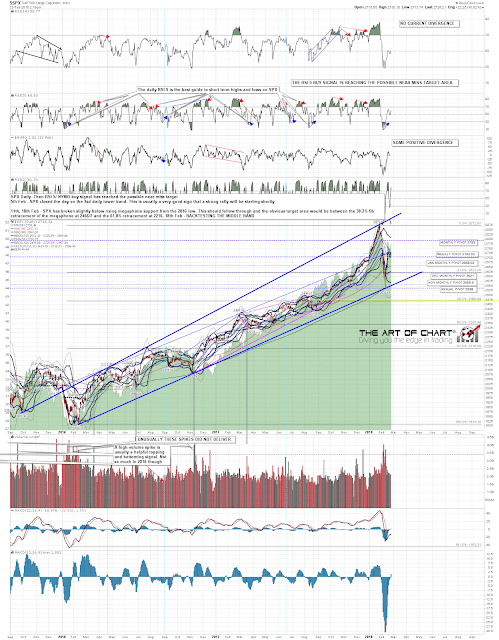 Today's title is a small homage to one of my favorites in his repertoire, as well as a note that as and when equities are ready for the next leg down, all the main equity indices, and very possibly oil, are likely to participate. If you'd like to see the title song for this post you can see that here. Tomorrow is a cycle trend day so if a high retest can be managed today, then we may see the decline start today. 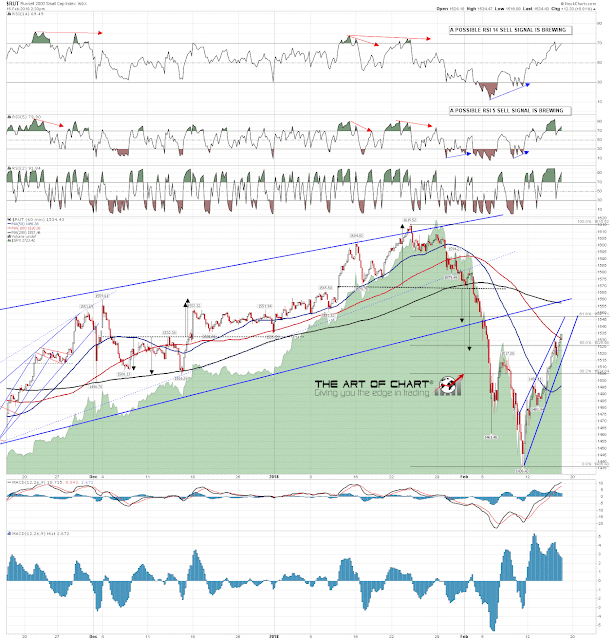 In the meantime I'm wondering about possible bullish triangles forming here on equity indices, and possibly CL. I have a question for my beloved readers today and I'm hoping one of you has a good answer. I've teamed up with an options expert friend to run a directional options portfolio based main on futures options for the last three months, and we've been recording the (very impressive so far) trades and results on a spreadsheet. We'd like to move this onto a professional web based alternative that we can publish from. The setup needs to work with futures options, auto-update the options prices, and not be restricted to basic options strategies etc. Do any of you know a good way to do this? The winning reply gets three months free membership if we later launch this as a paid service, which is where this is probably heading. Everyone have a great holiday weekend. A couple of announcements today. 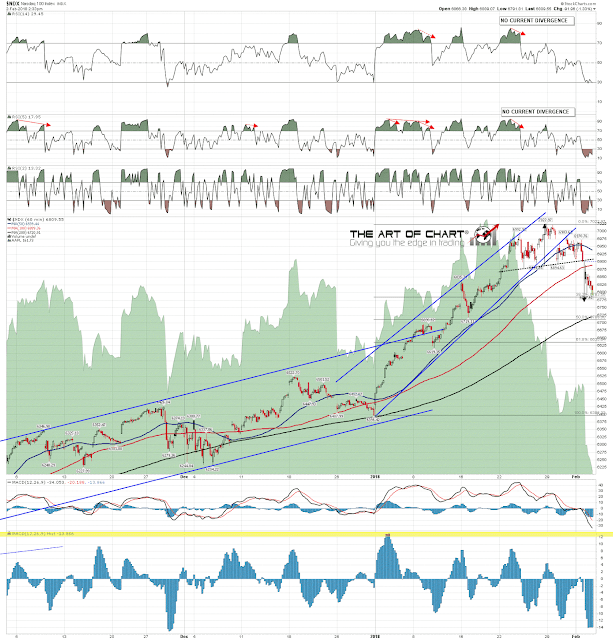 Firstly tonight's webinar at theartofchart.net has been delayed a week due to an unavoidable conflict, and will now be held on the same night as our Big Five & Sectors webinar on Thursday next week. You can register for either or both on our February Free Webinars page. 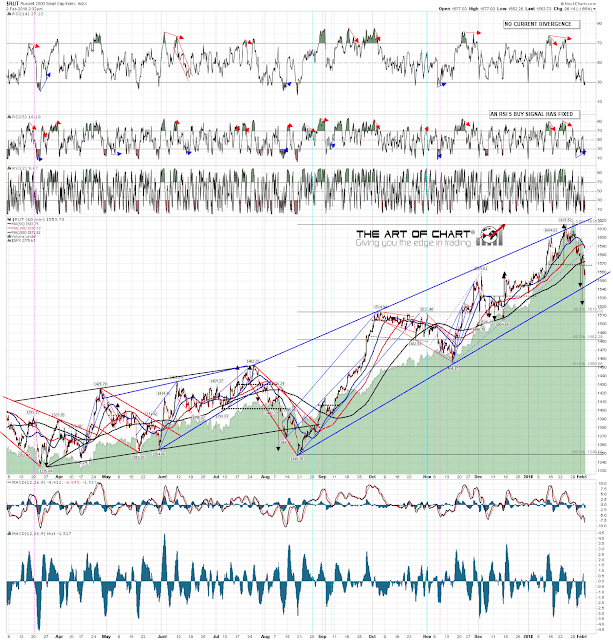 The hourly RSI 14 buy signals on NDX and RUT have reached target, and the SPX signal has reached the possible near miss target. 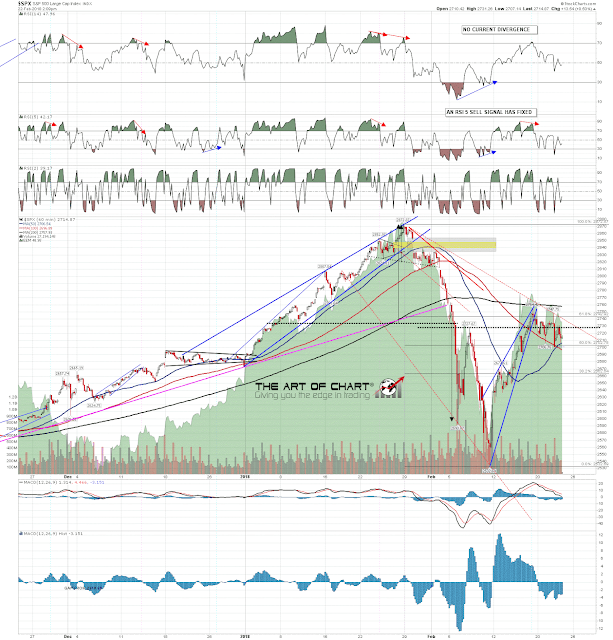 There is hourly negative divergence here, and all three indices are in the ideal rally high zone, we are expecting a rally high high soon and tomorrow is a possible cycle trend day on which we could see a significant decline. Discussed in detail on my intraday video below. 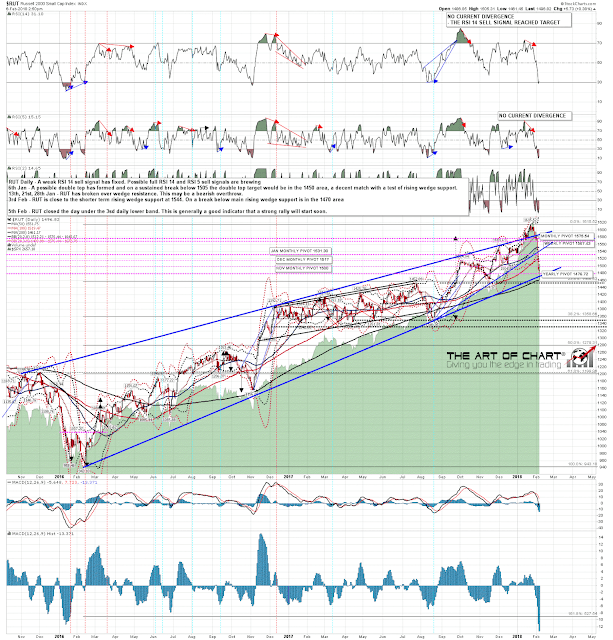 I'm preparing a post putting a strong technical argument that the bull market from the 2009 low is not finished, and having a look at where SPX is likely to be within the structure of that bull market. The post may not be out until after the close tomorrow, but the video segment will be posted on our YouTube channel and I'll be posting the link to that video on my twitter later today. Well that was interesting yesterday, and that was a really impressive move on equity indices that finally ended the longest trading period in SPX history without a 5% retracement. 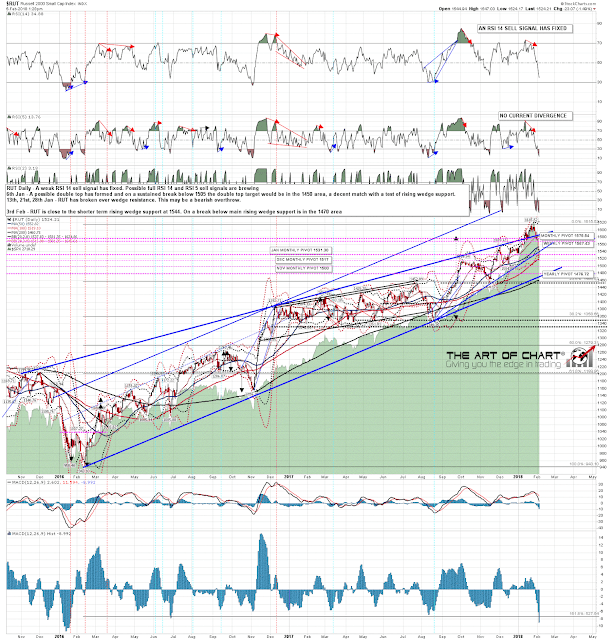 The mindless bullish euphoria has ended for the moment and overall we should be back in a more two way market environment for a while. 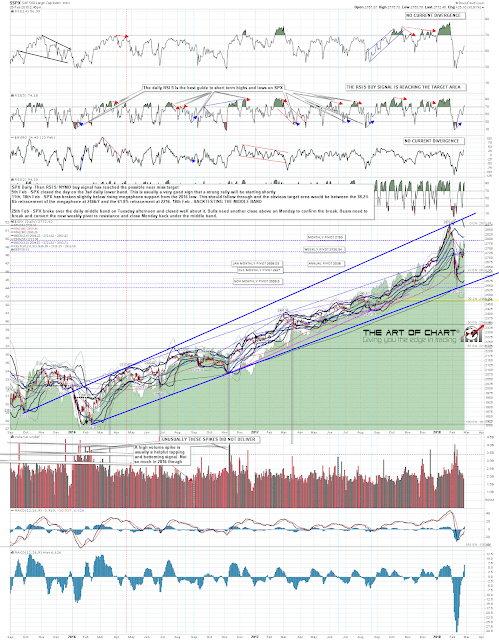 In terms of this current move we may now have started a retracement to take us into April or May. Is this the start of a crash? Unlikely, as this high is missing some important elements that would usually be seen at a serious top, but we may well be building towards such a serious top within a year or two. This is more akin to the bears starting to wake up after a long hibernation. They're going to need some breakfast, a lot of coffee and some warm-up exercise before they get seriously to work, and we're likely to see equity indices make new all time highs all round before that larger short setup is cooked. Was the low yesterday a significant low? Unlikely. Again at least some more work to the downside is likely required before equity indices can have another run at the all time highs. I was looking for a decline of more than 5% from the high on SPX to signal that the market was normalising into a more two way trading environment, and that has been hit today, and then some. 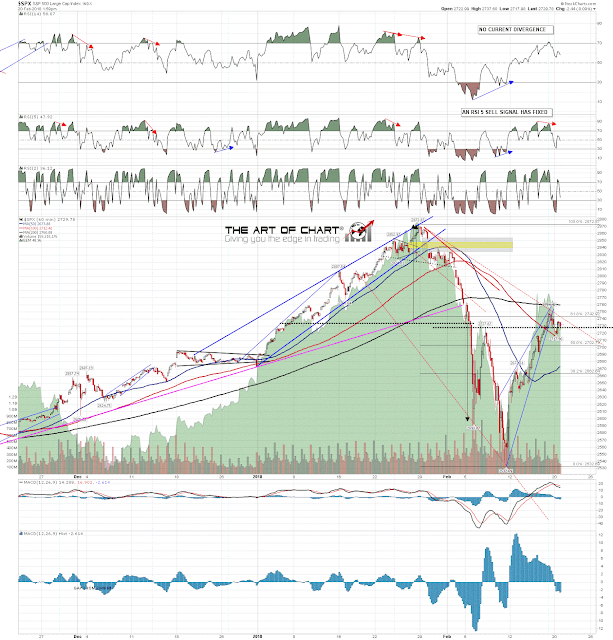 On the video below I was noting the large amount of positive divergence on various charts and liking the odds for a rally that has not yet materialised, with SPX punching 1% below the daily lower band at the LOD so far. 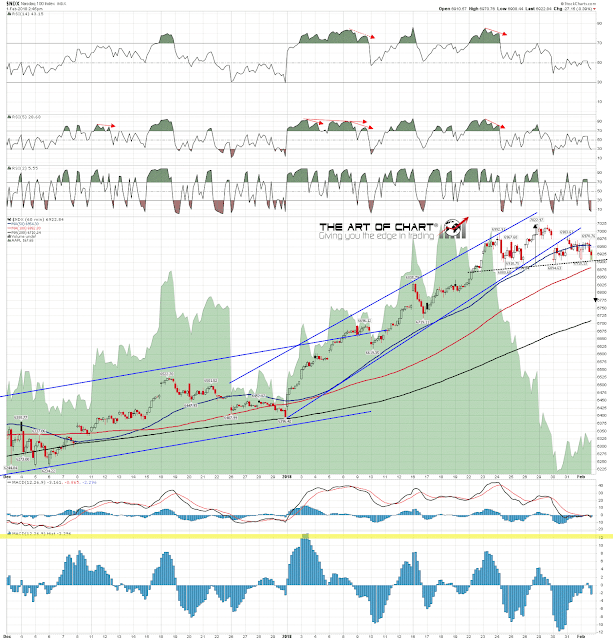 Stan and I did our free monthly Chart Chat at theartofchart.net yesterday. If you missed that you can see the recording on our February Free Webinars page. No futures charts or video this afternoon as I tripped over this morning while trying to find somewhere in an unfamiliar city using Google Maps. My phone smashed and that, needless to say, is my primary authentication device for accessing my futures charts. Only a temporary setback as I have a very good iPhone/iPad repair place, and I am a favorite customer with a bulk discount due to my household having a lot of apple devices, mainly being used by three rather careless/clumsy kids. I'll have the iPhone back tomorrow so I'm inclined to interpret this as a sign from above suggesting that I might consider going to bed early tonight. For a fact, I am rather tired so I think I'll be doing that. On to the markets then, going old school with no futures charts due to my morning mishap, and may I just say how delighted I am to see the bloodbath on the equity indices today. 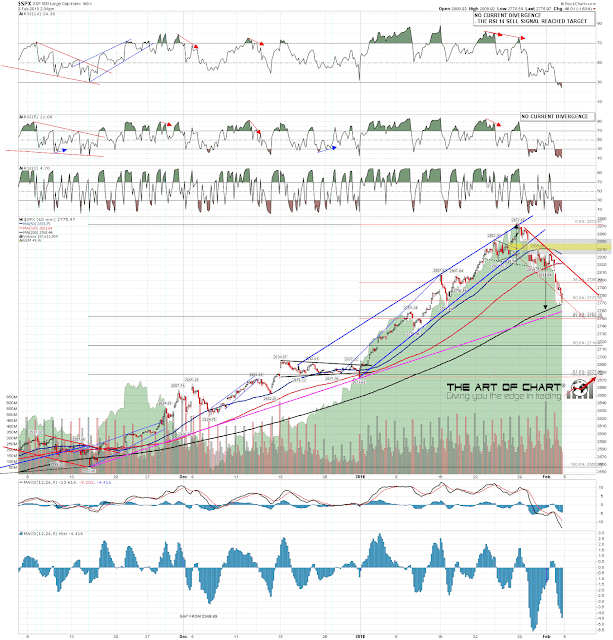 This was what I was hoping for when the termination triangles on SPX and NDX were spiking up a week ago. 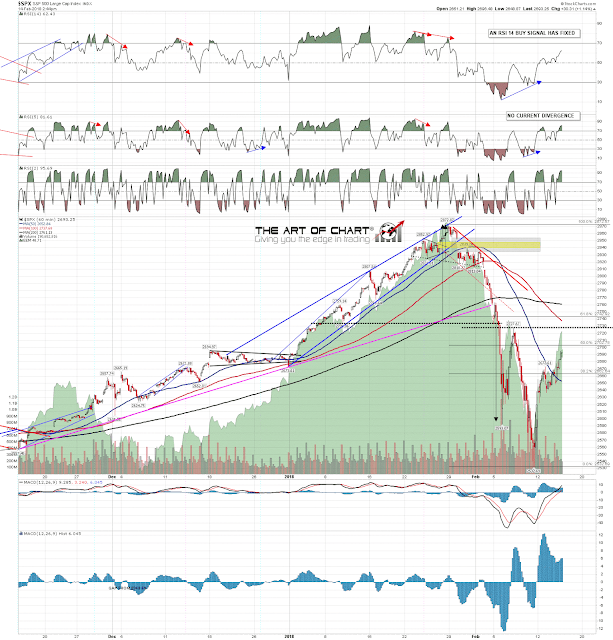 If we saw a sharp retracement from those triangle highs then we might well be watching the start of a two way market returning on equities, and those are a lot more interesting than one way markets. So where are we now on SPX, NDX and RUT?